If you've booked one of our villas in Lanzarote then chances are that you'll be staying in one of the three main resorts on the island; Costa Teguise, Playa Blanca or Puerto del Carmen. Each has its own character and identity - so which is the right resort for you? Costa Teguise is located in the north of the island and was developed during the 70s and 80s as an up market relation to Puerto del Carmen. Initially it became the stomping ground of wealthy German and Scandinavian tourists - but today, much as elsewhere on the island - British and Irish visitors are in the majority. The resort is entirely man made and as such could be said to lack an organic heart, although some would contend that this role is amply fulfilled by the Pueblo Marinero, a white washed development located in the centre of Costa Teguise which plays host to a number of bars and restaurants as well as a regular market. This also doesn't seem to have put off various VIP visitors from Spain as the King still maintains a house... well more of a palace really... at Las Maretas, which was originally built by King Hussein of Jordan and which is located just on the outskirts of the resort in the direction of the island capital of Arrecife. Although don't bother going for a nose around as sightseeing in this vicinity is distinctly discouraged. Costa Teguise's main attraction is undoubtedly its beaches - there are five main playas to explore in total and you can discover all of them by taking a stroll along the seafront promenade. Playa Cucharas is the largest and most popular of these - read our beach guide to find out more. 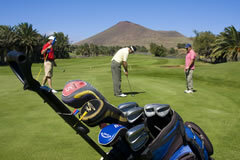 There's plenty to keep you occupied if you are planning a stay in one of our villas in Costa Teguise. The resort is home to one of only two golf courses on the island and is also an ideal spot for learning to windsurf. It also boasts the only Aquapark on Lanzarote - as well as the islands sole Aquarium, where you can swim with the sharks should the fancy take you. Come nightfall there are also plenty of good quality restaurants to enjoy. Two of our favourites are located just across the road from each other, close to the beach at Playa Bastian. The first, Oscar's, is something of a local institution and serves good quality international cuisine. If you prefer something a little more Spanish then just opposite you'll find El Nivarro. Both are very popular so booking in advance is advisable. Of Lanzarote's main resorts it would be fair to say that Costa Teguise enjoys the poorest location. It isn't as sheltered as Playa Blanca or Puerto del Carmen, which means it can feel very windy at times. It is also located to the north of its resort rivals, which means to keen be cloudier and cooler here. These factors don't really come into play during the summer months - but if you are planning a winter break then they can make a big difference.